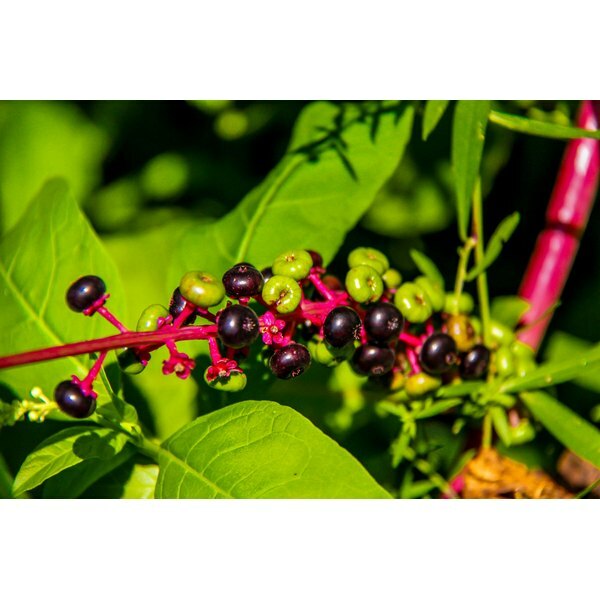 Phytolacca Americana, commonly known as pokeweed or American nightshade, produces berries that are poisonous unless prepared in specific ways. Phytolacca berry is available as a homeopathic remedy for weight loss and other purposes; only buy from reputable supplement manufacturers and homeopathic practitioners. Research is scant on the effectiveness of homeopathic remedies, according to the National Center for Complementary and Alternative Medicine, or NCCAM. Native to eastern North America, phytolacca has also become naturalized in Europe and Asia. Similar to a shrub, it grows wild in fields and woods, producing large pointed leaves, greenish-white flowers and purple-black berries. People use phytolacca as a folk and homeopathic remedy for many potential benefits, although research is lacking to support any of these uses, according to Drugs.com. Phytolacca is claimed to assist with weight loss, and treat fungal infections, tonsillitis, fluid retention, painful menstruation, syphilis, mumps and rheumatoid arthritis. It is also an alternative cancer treatment. Homeopathic remedies are highly diluted, unlike herbal preparations that contain much higher amounts of the active ingredient. Most research does not indicate effectiveness of homeopathy for any health condition, according to the NCCAM. However, the NCCAM notes that some studies of good quality have shown positive results from homeopathic treatment. A sample homeopathic brand says Phytolacca berry has beneficial effects on digestion, helps remove waste material in tissues throughout the body and improves lymphatic and vascular function. A maintenance dose of these tablets claims to prevent obesity and reduce weight. Because phytolacca berries are toxic, do not take any homeopathic preparation of them except from a reputable manufacturer. Young phytolacca berries may be eaten after you boil them in several changes of water, according to Drugs.com. Remove them from the water, pour out the used water, and begin again with new water. Boiling mature phytolacca berries does not reduce their toxicity. Phytolacca has been associated with nausea, severe vomiting, diarrhea, low blood pressure, seizures and breathing problems, reports the Memorial Sloan-Kettering Cancer Center. Serious cases of phytolacca toxicity can be fatal.